I recently met with a community of social and digital media producers, many of whom had a limited exposure and understanding of web analytics. So, I gave an introductory analytics presentation that tried to focus on social principles to help them realize the incredible opportunities analytics could offer them. Metcalfe’s Law, also known as the Network Effect, is a popular concept that argues the potential value of a network increases exponentially with every incremental increase. Most do not realize the same principle also applies to analytics. The more dimensions of data you collect, the higher potential value of the resulting data set. Since the analytics presentation was so well received, I thought I would share a public and reusable version that might help you in your work. Initial view of the slideshow. Click to view, copy, or reuse on Prezi’s site. Introduction: The rule of three is a commonly accepted writing and presentation principle that suggests groups of three things are more satisfying and effective than groups of other numbers. It’s the smallest number required to make a pattern, and hopefully that will make my content today more memorable for you all. And with this being a forum focusing on Social Media in particular, I thought it would be helpful to talk about the relationship between Analytics and the Network Effect. Regardless of your role in content creation, Analytics will help you measure, refine, and optimize results. Introduction to Analytics: A good digital analytics practice will help you understand the who, what, where, when, and how people interact with your site or app, but notice there is no explicit link that describes why people do what they do. However, armed with this data, we can make very educated guesses and perform additional research to help uncover the answer to that all-powerful why question. The supporting analytics team should also help you define a measurement strategy, implementation plan, and reporting framework to help you get the answers you need. What is the network effect? It is another term for a law attributed to Robert Metcalfe, who suggested the potential value of a network was equal to the square of the number of participants in said network. This applies to telephone networks, computer systems connected to the Internet, and naturally social networks. Keep in mind, however, that the actual value of the network depends on the actual connections made between users, filtering out spam, and the degree of participation from each node. Illustration of the network effect in action, using telephones. 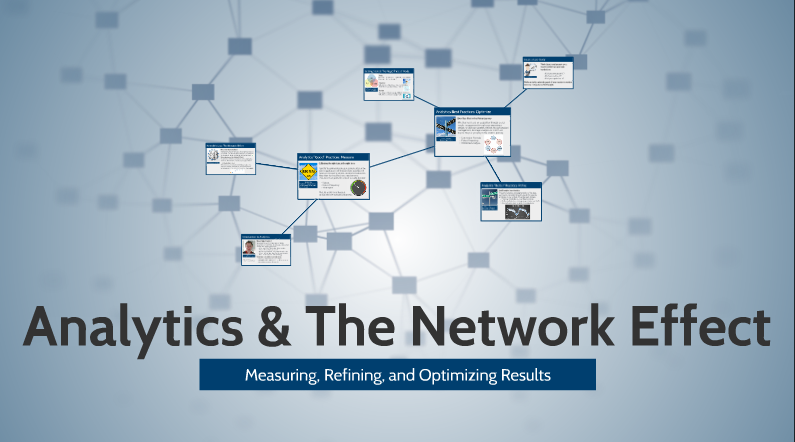 What you might not realize is that we see the network effect in action with Analytics, too! Dimensions of data represent users or nodes in a network, such as the page name, browser, geo-location of the visitor, and so on. The more data dimensions collected on your site or app, the more ways you can slice and dice the data to uncover interesting insights. For example, someone looking at social media analytics data that had no direct experience could make little sense of overall trends and posts. But with just one more data dimension—post type—a lot of the noise is filtered into signal. An analyst could then easily see that videos and photos garner a lot more attention than post with just text links or basic status updates. With that in mind, I would like to introduce another rule of three popularized by Dallin H. Oaks. This concept is one of understanding what is good, what is better, and what is best. What is simply good is simple measurement of the basics. In media, that usually revolves around visitors, return frequency, and time spent consuming content. Better is refining your analytics by giving context to the data. Ratios such as engagement rate or cost per engagement help tell a story about how effective a piece of content was. Additional filtering, breakdowns, and segmentation activities can help bring insights to the surface, and anomaly detection tools can help point any investigations in the right direction. The Best thing you can do with your analytics practice is optimize your measurement and inform your decision-making process. Analytics should not be a static tool, but rather a living, breathing entity that benefits from iterative development. Own your part in mapping the customer’s journey through your site or mobile app. Understanding critical conversion drivers will help you easily identify action items for you to take in an easily prioritized manner. In terms of social media and content creation, you would do well to get started with the industry standard metrics: Reach, Frequency, and Duration. These three metrics will give you a strong foundation to answer the most crucial questions about your efforts. So go and create a case study to evaluate your maturity in your analytics practice. Learn the difference between good metrics, better metrics, and best metrics. Understand what makes a good report, a better report, and the best reports. Most importantly, make the analytics practice a part of your content creation strategy, not just an afterthought.